Hello! Hello! 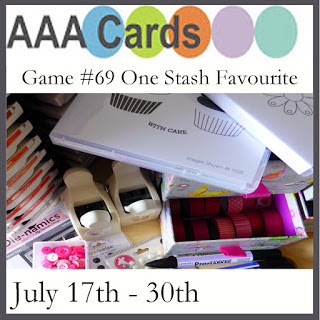 Time for a new game over at AAA Cards, and this time, the theme is "One Stash Favorite". Challenge winner will receive a gift certificate from our generous sponsor, Stampendous. It's very hard to pick a Stash Fav, but I have to say that PTI and Paper Smooches number dies are high on my fav list. I have made many cards/projects with numbers on them over time. I mentioned in another recent post, that this is the year of the Sweet 16 in my house. My twin boys are 16. There have been many invitations that have come our way this year, so the "1" and the "6" dies have been getting a workout! The cascade of gold dots put me in mind of an image from PTI's Grunge Me set. 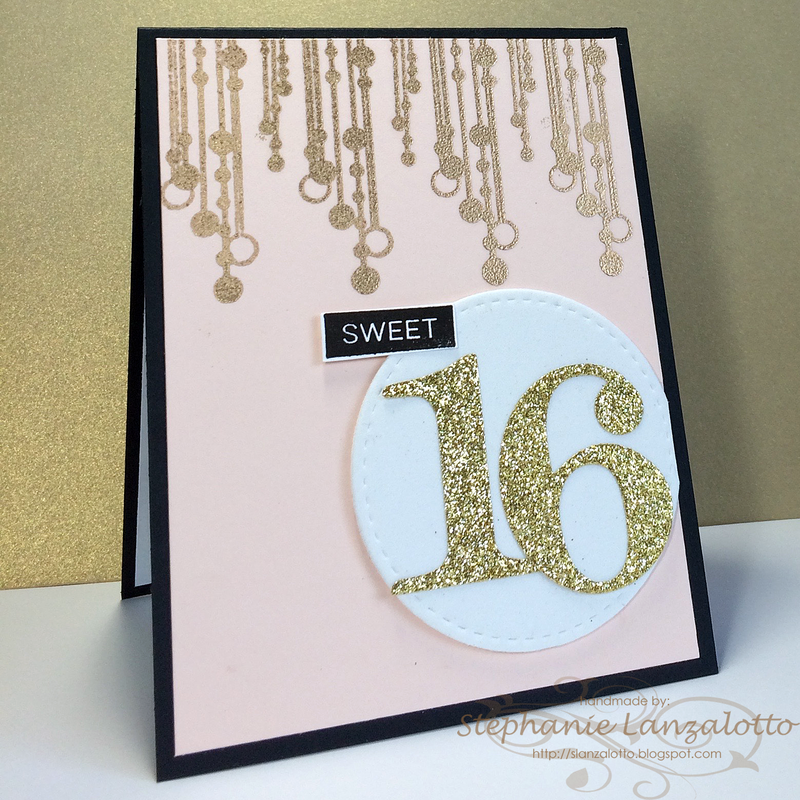 I stamped it repeatedly across the top, die cut the "16" from gold glitter paper with PTI Numbers dies, mounted them on a stitched circle, and added the "sweet" from MFT's Labelmaker Love. Please head on over the the AAA Cards Challenge Blog and see the wonderful inspiration the DT has created. What's in your stash that you consider a favorite??? Pull it out and give it a go, then link your project to the AAA Gallery. Have fun! And remember to keep it CAS! 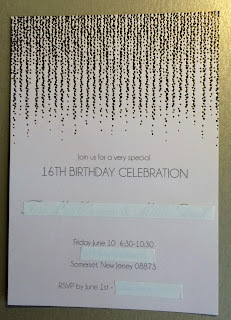 Those trailing lines at the top of your card are so appealing and I love your sparkly oversized number die cuts. And huge 16th wishes for your twins - wow twins! Gorgeous card, and I love the gold on that grunge stamp. A study in contrasts that work so very well. Great idea to make a card to match the invitation. You already know what they like! 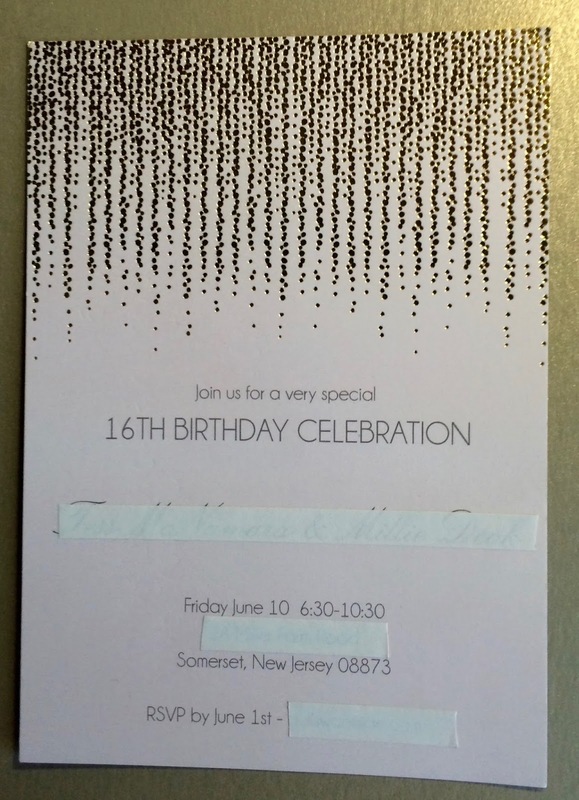 What a great idea to use the invitation as your muse! Love all the gold and sparkle and this is such a great design. Love the repeated stamping on the top. Really elegant card! I'm pinning it for future inspiration next time I need an elegant birthday card!